I hope everyone out there had a good Halloween! I’m still thinking about and following all of the Hurricane Sandy devastation. I hope everyone is hanging in there. My grandparents are currently on day 4 without electricity. Crazy. Jay and I had a nice Halloween evening. We went out to the Yard House, which just opened up in Raleigh. A lot of great beers on tap and the food was spectacular. I got garlic fries with my meal and am still tasting garlic today, lol. We also had half yard glasses of beer. It was a really fun evening. 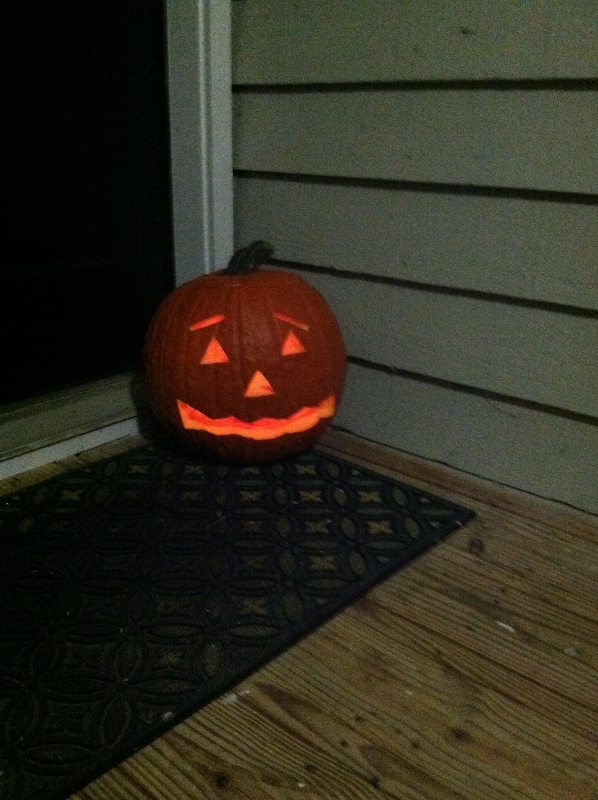 As promised, here’s our Jack O’Lantern all lit up. We didn’t get any trick-or-treaters, but one of these years we will! More later. This entry was posted in Halloween and tagged Halloween, Jack O'Lantern, Pumpkin. Bookmark the permalink.